How can I connect with my potential customers? Once logged in to your RUN account, click on My Pages from the side navigation bar to see the pages that your RUN subscription includes. 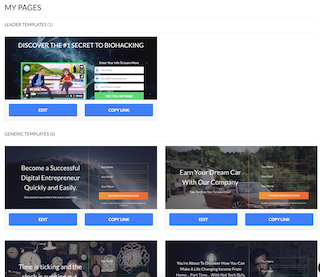 Select the template you would like to use to communicate with your potential customers. 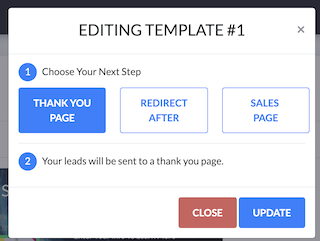 This popup will appear so you can select the next step. 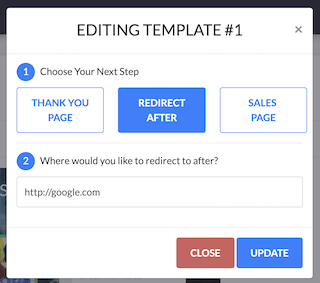 Should you wish to send your leads to a particular site, select the Redirect After button. 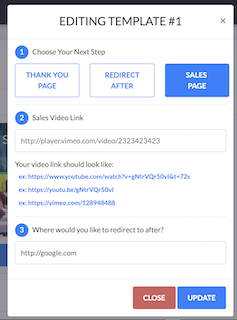 You can insert the URL for a sales video and then provide the one for the sales page. Once you have completed the form for either selection, be sure to click on Update to save. NOTE: Depending on the RUN subscription you have, your back office may not include the Leader template.